There is increasing public awareness worldwide of the level of malpractice by (and lack of accountability of) banks, law firms, the offshore magic circle, real estate agents, trust companies, large corporations and so on. Yet the ‘enabler industry’ is mounting a fightback against the modest yet significant transparency obligations imposed on it after Lux Leaks, Swiss Leaks, Panama Papers, Paradise Papers and other scandals. Meanwhile it is lobbying governments, even helping to formulate government policy, and continuing to benefit from unbalanced power, opacity and impunity. The professional enablers are often natural allies for those behind the dark money that is distorting economies and politics globally. Our annual tax justice conference on the 2nd and 3rd July in 2019 will strike at the heart of the beast. 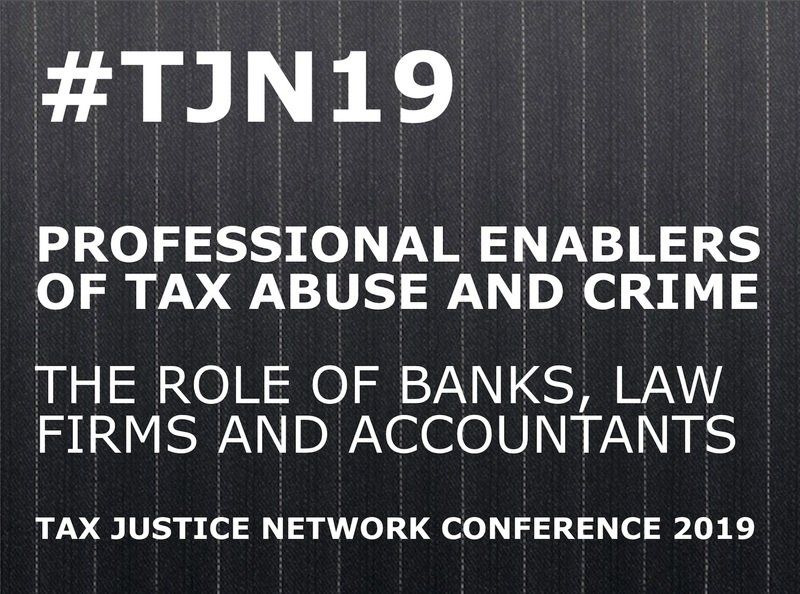 Co-organised with the Association for Accountancy & Business Affairs and City, University of London (CityPERC), the conference will focus on the role of professional enablers of tax abuse and crime, and will present and discuss ideas on how to deal with them. We’re looking for qualitative and quantitative research on the role and influence of the enablers, as well as innovative proposals for their better regulation. We would particularly like to hear from you if you are a practitioner working in crime prevention and detection agencies or asset recovery, if you are working with whistleblowers or if you are a whistleblower, or if you are monitoring lobbying and dark money, researching offshore practices and law, developing ideas on accountancy values and ethics, or have new ideas for protecting the public, democratic institutions and economies. The deadline for submitting papers for the conference is 14 December 2018. UPDATE: The deadline for submitting papers for the conference has been extended to 31 December 2018. We welcome proposals for panels (a chair and two or three speakers) and for innovative session formats addressing a particular theme. We will only consider gender-balanced sessions. Please submit abstracts or panel proposals of up to 500 words, along with the required supporting information, using our online application form by 14 December 2018. The review panel will communicate decisions in January 2019. Final papers will be due by March 2019.